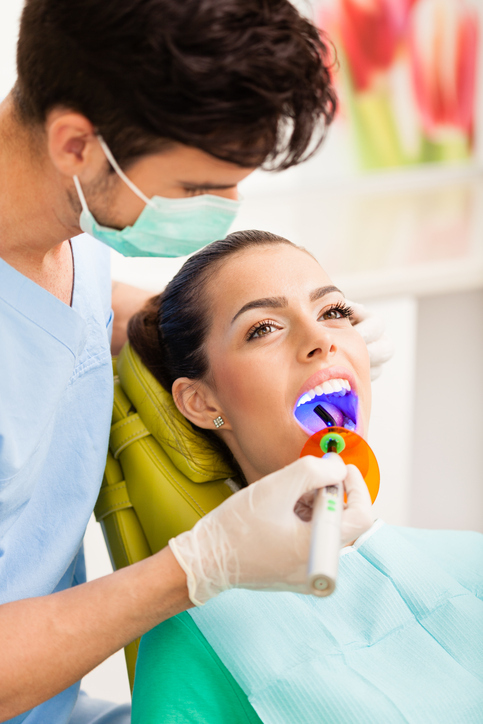 If you find you suffer from periodontal disease, and it’s negatively affecting the quality of your daily life, or your job, you should speak to a professional about laser gum surgery. Luckily, Central Florida Periodontics & Implantology is a premier provider of laser gum surgery in Orlando, FL. The traditional method for removing infected areas from the gums has been to cut around them with a blade or scalpel. There were many risks inherent in this traditional form of gum surgery, from anesthesia complications to blood clots and other bleeding issues. With laser gum surgery, however, the patient has more peace of mind, knowing that the risks are far reduced or nonexistent. In laser gum surgery, a laser light is used to target and remove harmful bacteria and diseased gum tissue from around the teeth, as well as for cleaning the gum pockets. With traditional gum surgery, patients are usually given general anesthesia to relax their bodies and reduce any pain that might occur during the procedure. Since laser gum therapy works by pointing a light in affected areas of your mouth and gums, general anesthesia is not necessary. Instead, local anesthesia is used to numb the areas that might be affected. This tends to put many patients at ease, because general anesthesia carries the risk of serious complications, like a heart attack or stroke, and can add to patient anxiety before surgery. With laser treatment, no bleeding also means no need for stitches. You are able to eat and speak faster than if you were to have traditional gum surgery—about 24 hours recovery time versus two to four weeks with scalpel and suture surgery—and patients are able to more quickly transition back to their daily lives. This often is one of the biggest deciding factors for patients who choose laser gum treatment, as they are eager to get back to work and resume their daily activities with minimal interruption. It’s no surprise that when a blade is used to cut out larger portions of gum, due to gingivitis or periodontal disease, that sensitive gums are highly prone to pain. Perhaps not during surgery itself (thanks to anesthesia), but certainly afterward. Luckily, laser gum surgery is a less invasive option. Patients report far fewer cases of pain, and find the post-surgery process far smoother. One of the most important advantages of laser gum surgery is its accuracy and precision when compared with more traditional methods. The goal is to keep as much healthy gum tissue as possible while only removing the diseased portions. This allows the periodontist to maintain your gum height, which not only looks more aesthetically pleasing, but also helps protect the roots of your teeth. Taking these many benefits into account, it’s no surprise that more patients are opting for laser gum surgery. To have your dental needs addressed by the premier provider of laser gum surgery in Orlando, FL, contact Central Florida Periodontics & Implantology today to make an appointment.